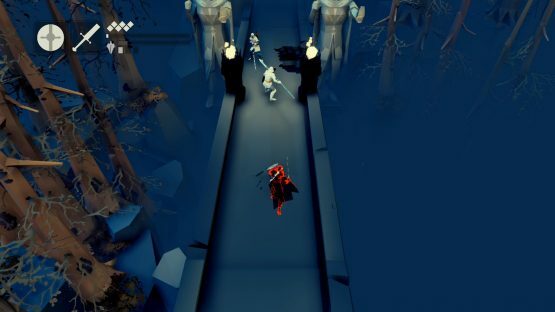 Fall of Light: Darkest Edition was made by two-person team RuneHeads, and it’s quite obvious that they have been heavily influenced by games such as Ico and the Dark Souls series. Everything from enemy designs, the opening movie, and even the combat is similar. While imitation is often regarded as the sincerest form of flattery it’s unfortunate that Fall of Light just doesn’t hold up too well when compared to these well-loved games. Things get off to an iffy start right from the beginning, with an opening cutscene that tries hard to be heavily atmospheric, but ends up failing thanks to its cliched story and slightly ropey voice acting. It’s all the usual stuff about twisted souls, and a fight between light and darkness. After a brief cutscene you’re left on your own to try to figure out what’s happening in the world and what your motivation is. The story isn’t handed to you on a plate, so you’ll have to actively search out little snippets of the game’s lore as you go. The overarching story does start to get more interesting as you dig deeper into it, but it’s a shame that the gameplay makes it such a slog to get to the more interesting bits. You’ll be playing as an old warrior, called Nyx, who’s travelling with his daughter to try to reach a place in the world that still has sunlight. You’ll have to lead your daughter Aether through some dark and dangerous dungeons in order to get there, fighting through hordes of enemies as well as solving the occasional puzzle. Combat is where the majority of the gameplay is, and unfortunately, it just isn’t as interesting as it should be. Nyx is an old warrior, and so maybe that’s the reason he feels so slow and clunky to control. You’ll start to wonder if it wasn’t time he was taken to a retirement home. 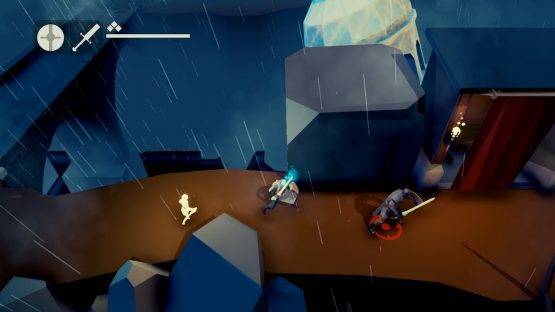 You’ll have the usual actions that you would expect from a game like this, a light and heavy attack, the ability to roll, as well as being able to defend. All his actions use up some of his stamina bar, which takes time to regenerate. This can lead to much of the combat feeling like you’re just trying to hit your enemy once and then retreating or walking in circles around your enemy until your stamina recharges. The hitboxes of enemies can also feel a bit random, with times that you stand right next to an enemy and swing your sword but the game won’t seem to register the hit. Other times you can stand further away and the game will have no problem detecting it. There are quite a lot of different weapons that you can find during your travels and they all feel fairly different to use. There are close range weapons such as daggers and short swords, heavy two-handed weapons, as well as things like crossbows. It’s actually one of the more fun aspects of the game—finding a new weapon and seeing how it handles and if you like its style. Of course, the game finds a way to quickly dampen your joy of experimenting with different weapons. You only have four weapon slots which means that to pick up a new weapon you’ll have to leave an old one behind. I can understand the developers wanting to add a touch of realism by not allowing you to have tardis-like pockets, but they could at least create some kind of magical central storage system that allows you to access previously found weapons without having to backtrack to whichever godforsaken dead-end path you ended up dumping an old weapon in. Different weapons are more effective against different types of enemy, but the fear of having to drop a weapon somewhere and then not remembering where you left it means that you’re more likely to just stick with a couple of weapon set-ups that you know you’re comfortable with. Similar to how Demon’s Souls begins, you won’t get the ability to level up until after the first boss fight. However, it’s not a very intricate levelling up system. The only thing that you’ll be able to increase is your health. Things like your defence and offensive strength never increase, so you never really get that nice feeling of gradually getting stronger throughout the game. 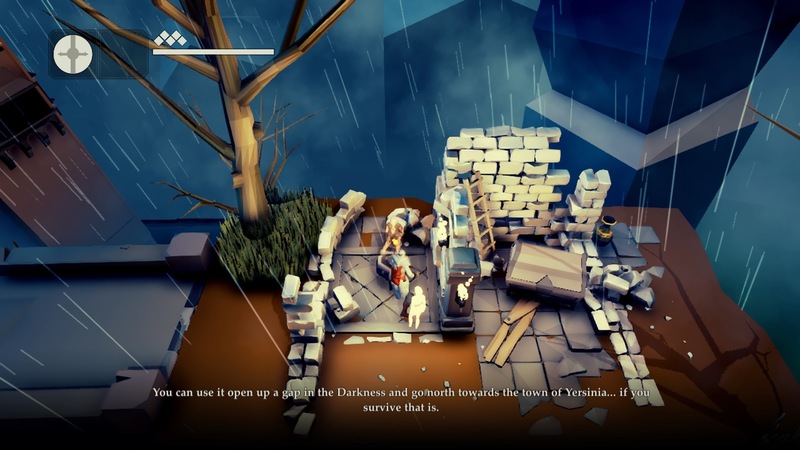 As I mentioned earlier, the game does also have some similarities to Ico. You’ll be leading your daughter, Aether, around with you and you can give her simple commands such as asking her to stay put, or holding her hand. Babysitting is not the most interesting game mechanic around, and it ends up getting tiresome pretty quickly. Aether has an annoying habit of getting kidnapped by skeleton-like creatures. They will appear every now and then and you will need to hack them to pieces before they grab her. If they do get her, then she’ll disappear and be locked away in a little cage somewhere nearby. You’ll then need to go rescue her. I also found out pretty quickly that if you’re not careful and have her right next to you when you move to a new screen then she’ll automatically be snatched. The first couple of times this happened it was exciting, but the novelty wore off pretty quickly. After she’s been taken you can press a button to light up a path on the ground, which shows the direction she’s in but this feature is a little buggy. There were a number of times where the light would point me towards one area, but once arriving there I’d be told that she wasn’t in that area at all so I’d then need to backtrack. The light path would keep pointing me off screen, so in the end I’d have to just ignore it and instead rely on my memory of where I last remembered seeing a cage. Aether being abducted isn’t the only time that she won’t be by your side. Whenever you die (which with the clunky combat system is likely to be a lot) you’ll be warped back to the nearest activated checkpoint, but Aether will have died where you fell. This will mean that you need to backtrack to where you died in order to revive her. This ends up feeling really tedious due to a number of things that you can’t do without her. When she’s not with you, you can’t activate new check points, level up, and you also can’t recharge your healing ability. 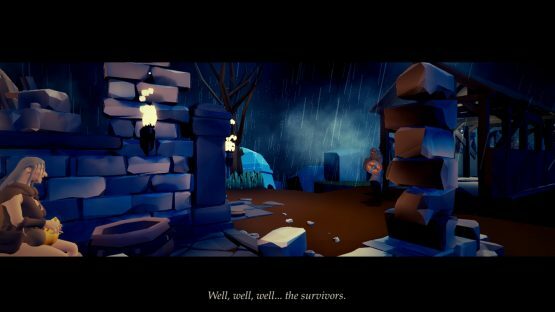 Visually the game has a dark and moody look to it. There’s plenty of things like dead soldiers stuck up on pikes, burning bonfires, and hidden enemies to try to ramp up the tension. It’s got quite a simplistic style of graphics, but it gets the job done. You’ll be viewing things from a top-down perspective, and there are occasionally issues with the camera obscuring your view, but thankfully this doesn’t happen too often. It’s likely to take you around 10-15 hours to get to the end. There is a little bit of replayability with multiple endings and a harder difficulty mode available, but as the game is not that much fun the first time round I don’t see too many players trudging through it again. 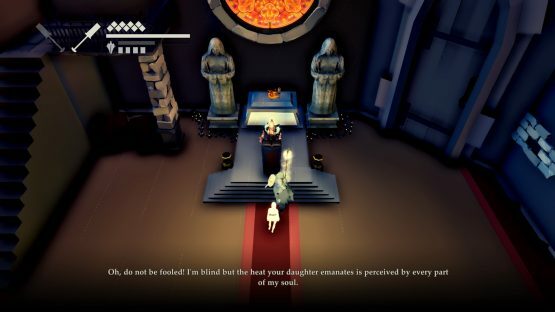 While Fall of Light: Darkest Edition does have an interesting tale to tell, it’s wrapped up in so many layers of mediocrity that it’s unlikely you’ll get far enough to care. Poor combat, annoying death mechanics, and an irritating inventory system make the game tedious to play through. Fall of Light: Darkest Edition review code provided by publisher. 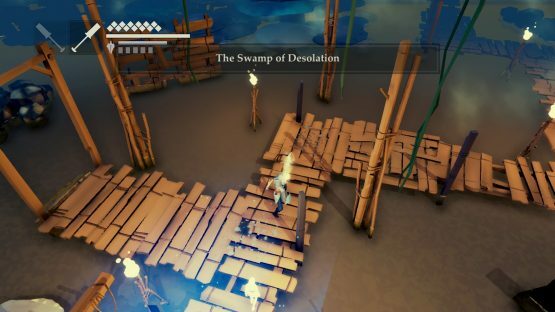 Version 1.00 reviewed on a standard PlayStation 4. For more information on scoring, please read our Review Policy here.